Insert a single image anywhere on your page, with the option to provide a caption and/or a link. The image block is the most basic of all the media-type blocks. Use it to insert a single image somewhere on your page/post. 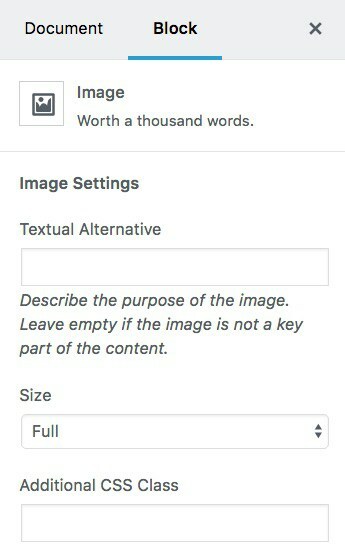 Gutenberg's new image block functions almost the same way as the classic editor's "Add Media" button. Align your image to the left, right or center, provide a caption, link, alt text, etc. Let's take a look at how to add an image & customize its style & settings. One of the new features of the Gutenberg image block is the ability to resize your image. You can't crop it, but you can include a smaller version while maintaining the image dimensions. Drag either inward or outward, depending on whether you want to decrease or increase the image's size. Changing the alignment will actually move your image in relation to the content surrounding it. For example, a left block alignment will move your image to the left, and whatever blocks you have below that, they will float up to the right side of your image. Left & Right will float your image to its respective side. Center will align your image block in the center of the page, possibly adding some space to the left & right of it. NOTE: You may need to reduce the size of your image for the left & right alignment options to work properly. If you want your image to link to another destination, you can simply use the link icon in the toolbar. Most of the image settings are located right above the image block. There are a few additional things you can do in the advanced settings panel. This is more commonly known as "Alt Text." If your image is a main part of the content, you should provide a textual description of it. If your image is purely for design purposes, you can leave this blank. You can adjust the size by moving the blue circles on the 4 corners, as described above. However, you can also select from one of your pre-determined WordPress image sizes here. If you're looking for even more control over your image, you can add an additional CSS class and write custom styles of your own. The image block can only be converted to one other block type, and that's a gallery. Choosing this option will allow you to choose more images—in addition to your current one—to add to a gallery.